Sure, it’s hot down here in Texas, but we love summer, regardless of the 100 degree heat index and humidity that makes the air feel like a swimming pool. Wine nights with our girlfriends late into the evening, barbeques with the neighbors as the sun goes down, long days on the lake with friends… summer is all about spending time outside and with the people you love. If you’ve read any of our other recipe roundups, you know that we Texans love our Tex-Mex. So of course this 20 Minute Fajita Bowl had to be included in our list of recipes that take 30 minutes or under to prepare. Filled with fresh veggies and homemade salsa, this recipe is the perfect complement to a warm summer’s evening. The most time you’ll spend on this recipe is sauteing the onion and bell pepper—SO EASY. Plus, it’s vegan AND gluten free! Ditch takeout—make your own pizza, and in less time than it would take to deliver! This Sweet Potato and Chorizo Pizza relies on pre-made pizza crust to get you in and out of the kitchen in time for your fam’s weekly movie night. The combo of veggies, sweet potato, and chorizo make this pizza a fresh alternative for your palate over the average cheese and pepperoni topping. Yum! We love crunching on fresh lettuce wraps in the summer, and these Barbecued Chinese Chicken Lettuce Wraps look d-i-v-i-n-e. Not only that, but all you need is a skillet or wok to cook up the chicken and veggie filling! An easy and delicious recipe with quick clean-up, too?! We’ll take it, please and thanks. Okay, so maaaaybe this one is cheating because it requires a few hours in the crockpot, but this Indian-Spiced Chicken and Cauliflower looked too delicious to not include in our list. 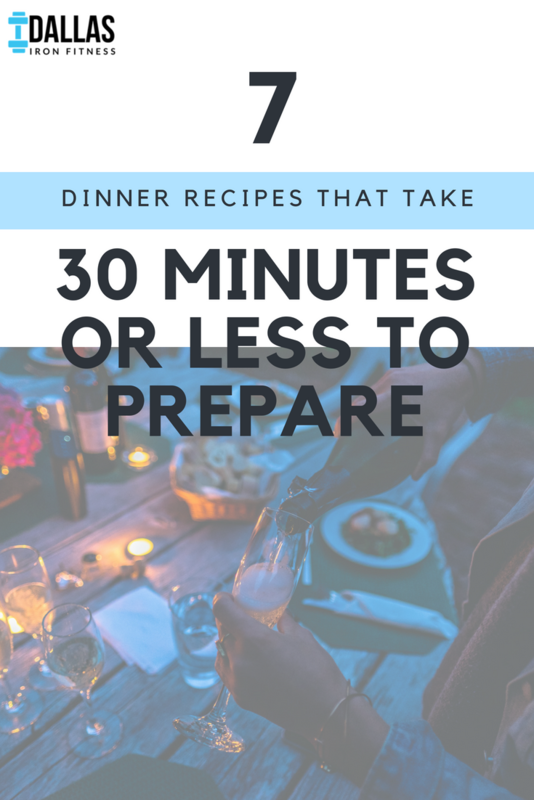 Plus, that’s the beauty of crockpots—you get to go live your life and then come home to a fresh-cooked meal. For this recipe, simply combine all the ingredients together in the crockpot, set the timer, then go enjoy your afternoon at the pool with friends. Your Indian-Spiced Chicken and Cauliflower will be ready for you when you get home—all that’s left will be preparing the rice! It’s the perfect recipe for a busy summer’s day! More Tex-Mex (sorry not sorry… we couldn’t resist). These Cheesy Avocado Quesadillas clock in at around 15 minutes cook-time and is so simple to make; it’s the perfect dinner after a day where you just-can’t anymore. Gluten free babes and dudes can trade out the flour tortillas for corn tortillas. We love a good quinoa bowl, and this Chicken Apple Sausage Quinoa looks like it could be one of our new favorites. Every step of this quinoa bowl takes only a few minutes to complete, so you’ll have more time to spend on the deck with the hubby watching the fireflies dance in the yard. Plus, it’s a great source of protein and offers some good-for-your-digestive-track fiber, too! Wins all around. Summer is HERE, and so is Dallas Iron Fitness! Let us help you get ready for that trip to the beach and days at the lake! With online and in-person fitness training as well as local Dallas classes, Dallas Iron Fitness has the right program to fit your summer goals.